Tucson AZ is situated in the Sonoran Desert in southern Arizona. The Sonoran Desert is an expansive desert area of some 110,000 square miles. Arizona and California, and of Northwestern Mexico in Sonora, Baja California and Baja California Sur are in this desert. The western portion of the United States–Mexico border also passes through the Sonoran Desert. The Sonoran desert wraps around the northern end of the Gulf of California and is the hottest desert in North America. The Gulf of California, also known as the Sea of Cortez, is less than 200 miles from Tucson AZ and significantly influences Tucson’s climate. The Sonoran Desert area is divided into two halves by the Gulf of California. The Baja California peninsula to the west, and the Mexican state of Sonora to the east. The Gulf Of California was created some 6 million years ago when the Baja California Peninsula was pulled from North America. This event allowed ocean water to flow into the heart of the Sonoran Desert and bring life creating moisture to the desert lands. The Gulf of California is 700 miles long and 30 to 150 miles wide. It has an average depth of over ½ mile deep. Interestingly, the surface area of the Gulf of California is almost the same as the Sonoran Desert itself. About 100,000 square miles. This body of water in the middle of the Sonoran Desert is the major contributor to the monsoon season rains in Tucson and Southern Arizona. As water from the Gulf evaporates, it rises into the northward flowing air currents. The higher summer moisture causes about ½ of Tucson’s annual rainfall. These annual monsoon rains are essential in maintaining the diversity of the Sonoran Desert. Without the monsoons, much of the plant life and desert amphibians would not survive. There are only a few species that owe their existence to the sea that sits in the middle of the desert in which they live. 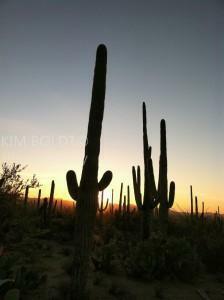 The Sonora Desert is the only place in the world where the famous saguaro cactus can be found. Other cacti found in the desert landscape include the cholla, fishhook, prickly pear and organ pipe as well as others. These cactus varieties provide food and homes to many desert mammals and birds. Living in Arizona, especially Tucson, means the Sonora Desert is at your door. The magic of the Sonora Desert is offers Tucsonans an endless list of things to do and see. The beauty of the mountains surrounding Tucson provide home sites with desert vistas and a backdrop for most Tucson homes. Spectacular desert sunsets that create back lighting for Saguaro cactus and trees that make the end of every day something to look forward too. The Sonora Desert is a vast area with diverse and conflicting images. Dry arid land with blooming flowers in the spring. Wash flowing with water during the monsoon season. Animal life from small lizards to large Javelina. Birds from small finches to soaring hawks. All are a part of the Sonora Desert that Tucson resides in. To get up close and personal with the desert and its wild life visit the Sonara Desert Museum.